Wouldn't it be wonderful to not only bring your Rosemary indoors but to pot it up so that it looks decorative, adds life to your indoors & smells wonderful? Here are a few tips to help. First select a container you want to plant in. 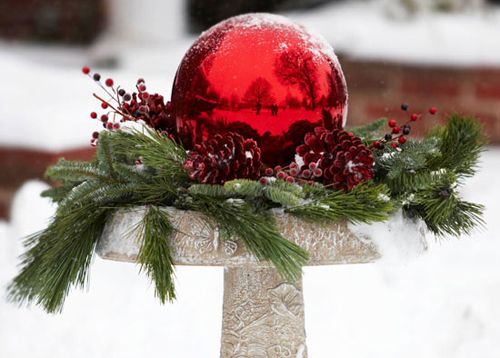 Do you want a decorative urn or a natural terracotta clay container? 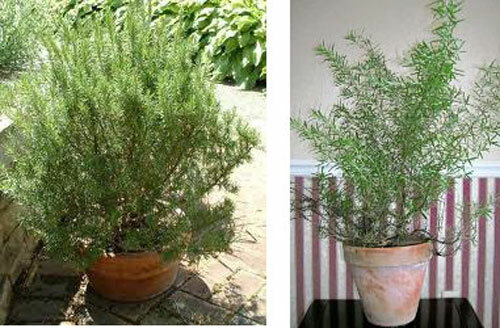 If you are putting this potted rosemary in your kitchen pick up the colors you are already using. Red, Yellow, bright Orange, glossy or matte finishes. 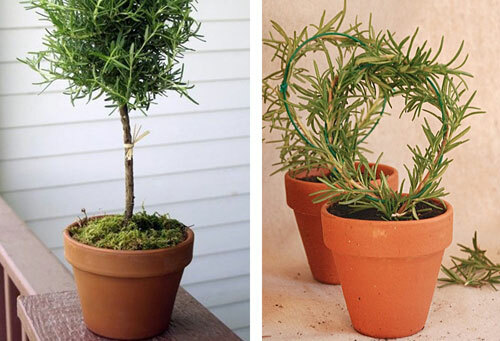 Make sure your container is large enough to hold a cluster of potted rosemary but no so large that it takes up needed space. We prefer you use a pot with a drain hole which means you will need a saucer to catch water run-off. Have fun here and take some time to decide. First, fill the pots with potting soil. 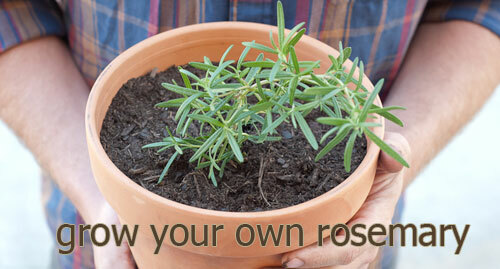 Then use a starter plant from your local garden center or take a stem off of your existing rosemary plant outside. 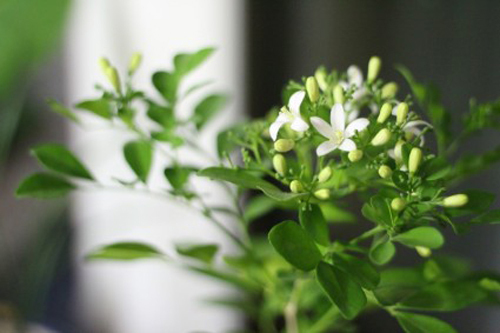 Remove the bottom leaves, place it in moist soil in a garden pot and in a couple of weeks it should sprout. Now place the pot where you need and want it the most. On a kitchen island where you can clip off pieces to cook with, how about on a living room mantle where the fragrance will fill the room with heaven. We even recommend placing one pot in the bathroom. Last tip: Don't over water. People tend to over water indoor potted plants. Keep the soil slightly moist but not damp. Look at the leaves and make sure they are staying deep green and not yellow. As the days stay dark longer and the wind blows colder outside, it's time to take stock of what is happening inside. Do you need some life or color indoors? How about warming up the place with some life? 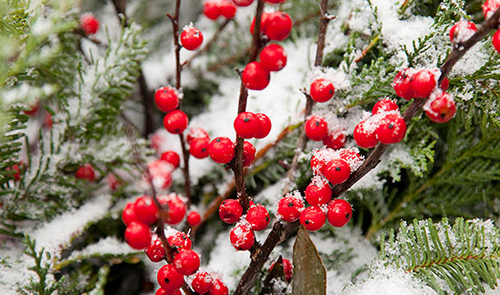 Now is the time we suggest focusing on your houseplants & indoor gardening needs. 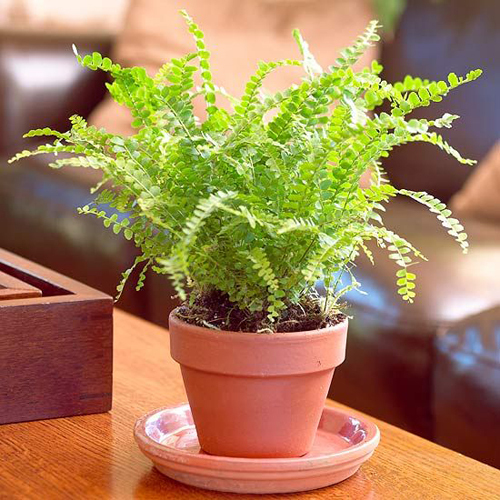 Below are some suggestions for easy to grow indoor plants that will add everything that is currently missing. 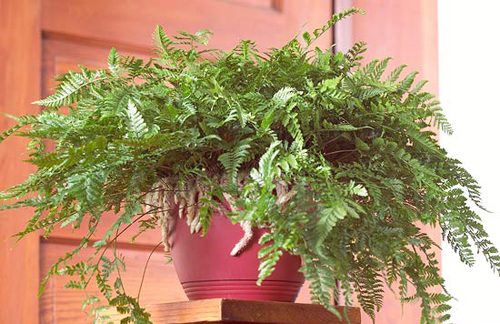 You may remember this houseplant because it's been around for years and is still very popular. Spider Plant - with it's legs shooting up and out and thin petals. They come in different varieties from dark green to light with cream or white stripes. 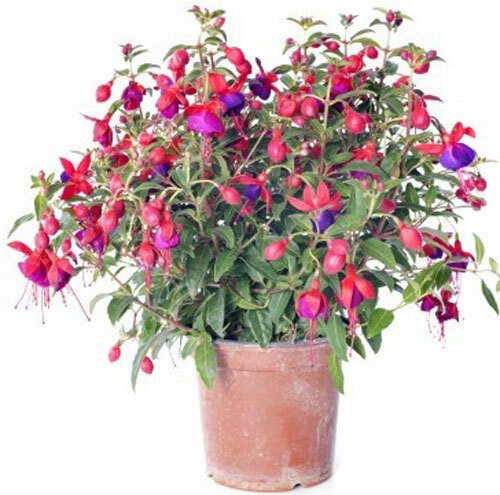 They are great for planting in a bright colorful flowerpot or hanging in an empty corner of a room where some color & life is needed. Super easy to care for this one is a good one to pot up inside with great success. We love the brightly colored high gloss planter. Its boldness compliments the plants muted colors. 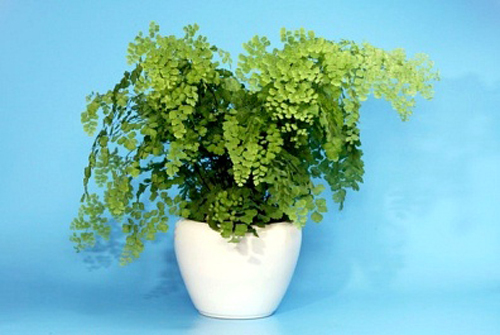 Have you ever heard of the houseplant Peperomia? Well we hadn't till we saw this on the Better Homes & Garden Website. 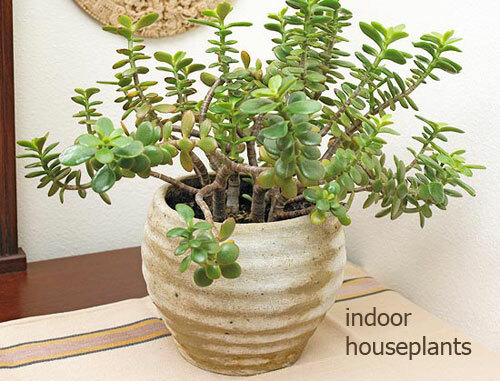 They are a diverse group of small houseplants with waxy and often highly textured leaves. Red edge (pictured) has a narrow band of read surrounding a wide creamy leaf margins. 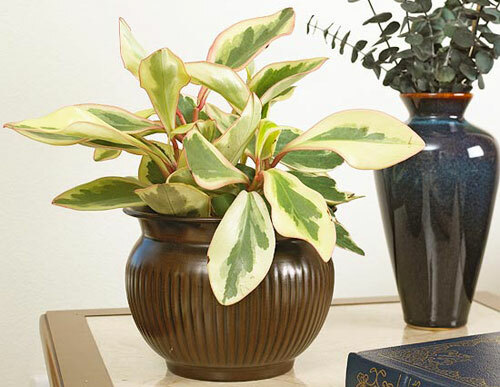 This potted houseplant is colorful, waxy leaves add color and they don't take up much room. Not good around dogs or cats because it's poisonous. 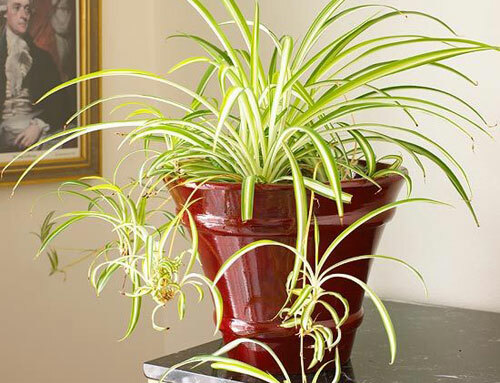 We love this houseplant in a brightly colored pot where the top has a large opening so the broad leaves can burst out. 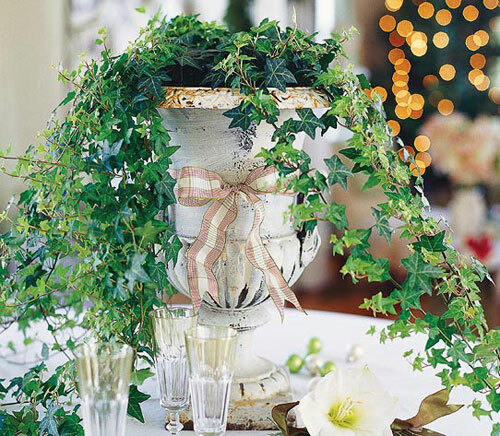 Probably our favorite suggestion for a potted indoor plant is this English Ivy. 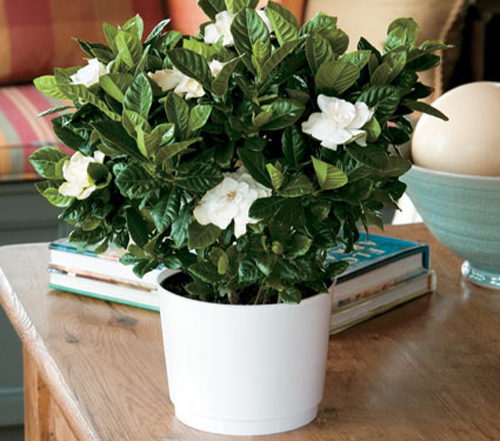 Commonly grown outdoors and used as ground cover this plant makes a perfect houseplant. Set it up high on a mantle where it's stems can trail down or train the stems onto a topiary form to create a more formal, English style effect. It's really easy to use cuttings off of. Snip a 5" long piece of the stem, remove the bottom leaves and pot it up in moist soil. Keep it moist and in a couple of weeks it should root. AWESOME! Potting English Ivy up for indoors is fun and creative. 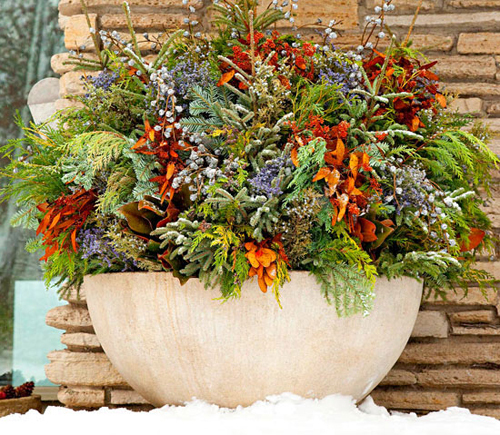 Using a garden urn like the photo is really unique and lovely. But, ivy grows great in most pots, just be sure to place the planters where the ivy can trail. 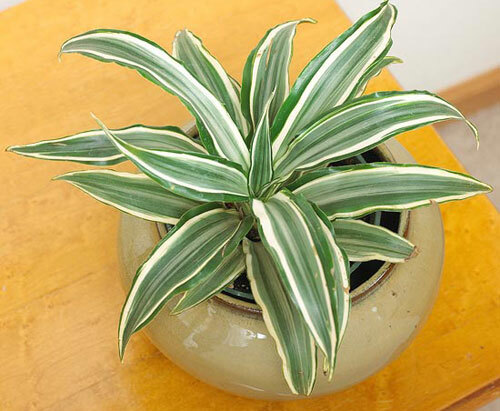 Green Dracaena - offer solid green leaves or multi colored foliage. All form compact rosettes when young but will eventually open up and become lovely. They tolerate low light but produce better color in medium to bright light. 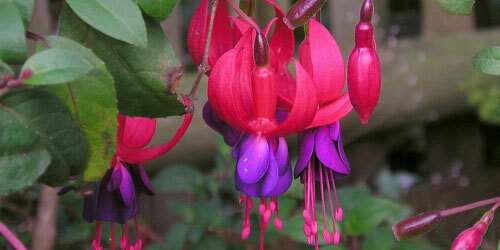 These look fantastic in brightly colored garden planters or pots with a pattern on them. 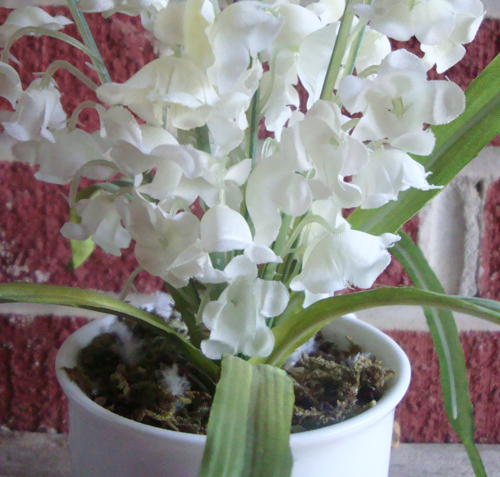 Read more.....Keys to growing healthy indoor plants. The guys from thehorticult.com came up with a great DIY project that we had to share. 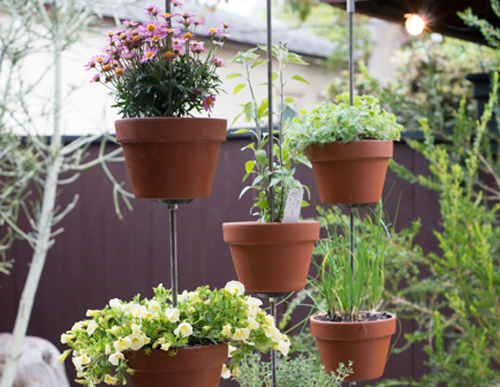 It shows how to take plain, simple, clay flowerpots and turn them into the most wonderful vertical garden. One that you can use anywhere. 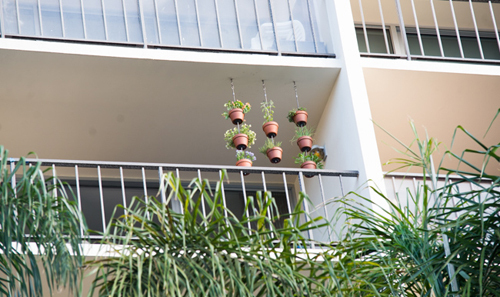 On a balcony, in the garden, next to a kitchen door with potted herbs, or next to your BBQ with herbs. This project is so wonderful we can't praise it enough. 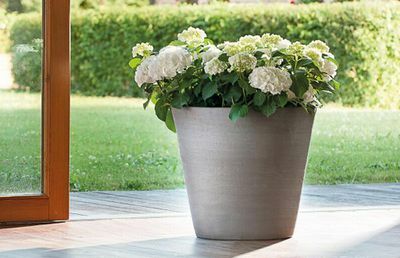 Think of all the places you can hang these flowerpots that will give you a privacy screen, decorate a blank garden or patio wall or add height to a low planted garden. So, get your clay flowerpots from us at Arizona Pottery, read thru this tutorial and good luck. 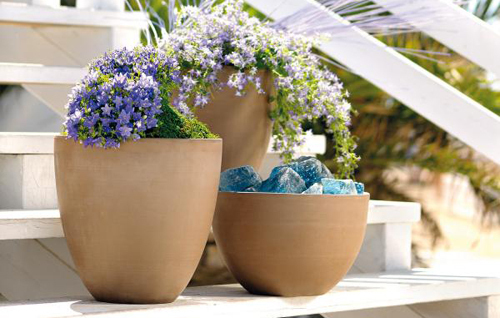 We know once you start with a few pots you will be find yourself using this idea all over your yard or garden areas. Click here for step by step instruction. Read more....Know your indoor plants lighting needs. vertical garden, diy planters, clay pot vertical project, flowerpot vertical garden, garden project with pots. 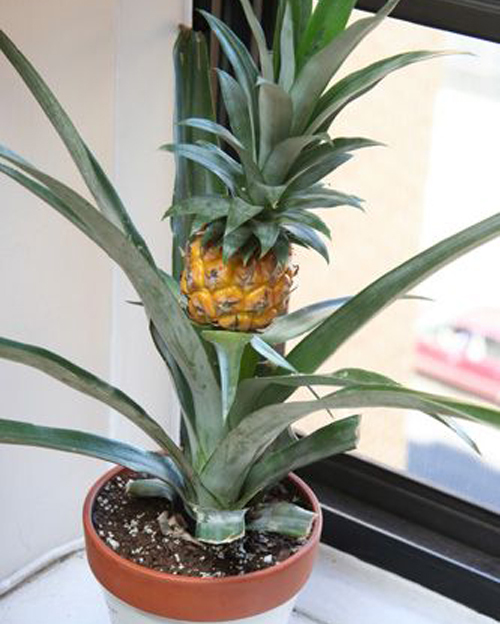 Did you know you could grow a pineapple bush from the top of a pineapple? Believe it or not it's becoming more popular. Since we can still find whole pineapples in the store with the tops still attached it's a easy project to take on. Cut the top off a pineapple and remove all the fruit. If you leave any fruit on the top it will rot the top and this will not work. Remove the bottom 1 1/2" of leaves. the stalk with root but the leaves will rot. Dry the top of the pineapple for two days until a callous forms. Depending on the humidity this could be as short as a day or as long as a week. Do this in a cool and dry place. If you skip this step the stalk will rot. Dip the stalk end in water and then into rooting hormone. This makes rooting faster. Mist frequently to keep the soil moist but not wet. Roots on your pineapple bush should appear in 2 to 3 weeks. 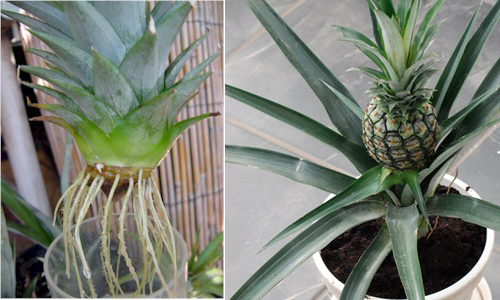 Once roots appear, re-pot the pineapple in a vertical position into a fast growing potting soil. Remember pineapples are actually bromeliads. Hence they like tropical conditions. High light, constant humidity and constant lite fertilizer in the summer time. In 2 to 3 years, your pineapple bush will grow another pineapple. In order to pick a few fruits each year just replace the picked pineapple, with its top and the cycle will continue. Read more.....Grow your own salad fixings. potted pineapple, grow pineapple in pots, indoor pineapple bush, potted pineapple bush, indoor pots. 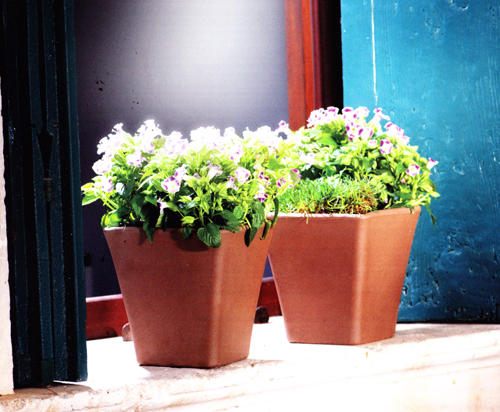 Terracotta pots - new, used, large, small - whatever you want. Spray sealer for the leaf - found in the same area as the leaf. Normally you would follow what the leaf directions are for applying. But, in the case of clay flowerpots which are porous you will have to adjust. The easiest way to do this is brush on a length of glue at a time & immediately apply the leaf. Don't wait to apply the leaf to the size because it will dry almost immediately. Continue around the entire rim of the pot until complete. Try not to brush the glue over the existing leaf as it will dull the shine. 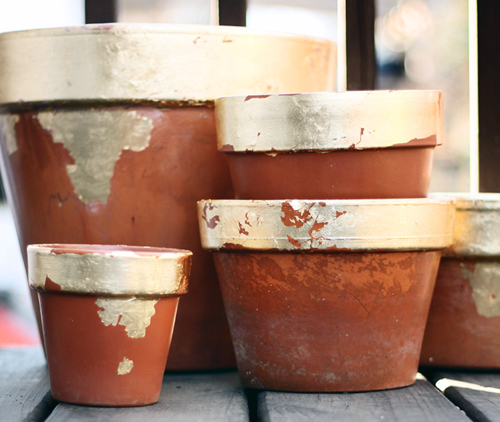 After all pots are gilded, coat them with the spray sealer. If you like the worn look on the bottom of the pots don't spray that part with sealer because it will clean the look of the flower pot up. That's it. Plant and enjoy! Perfect for a holiday table or wedding reception. Elegant and classy! Read more..... Tips on how to repair a broken pot. Read more..... Candy Corn Pots for Halloween.